Something to look forward to: Apparently Hello Games has been quietly at work on No Man's Sky VR. Best of all, you can play it for free this summer when it ships as part of the Beyond patch. The update is just another one of HG's sweeping content packages (its sixth if you're counting). Earlier this month we reported that Hello Games was preparing to release a huge No Man's Sky update titled “Beyond” that would contain three major features. The first is a complete overhaul to the multiplayer system that promises a "new social and multiplayer experience." The second component, announced during Sony’s State of Play presentation on Monday, is VR support. This is a pretty big feat considering that it is not just first-person mode on a VR headset. 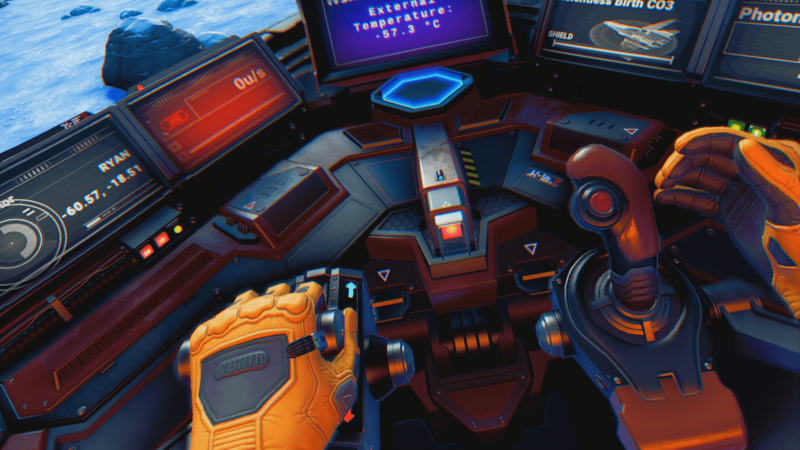 Hello Games has gone to the trouble of creating the animations of the hands, ship controls and other things to make it a competent VR experience (see below). Interestingly, playing in virtual reality will not lock you into a VR-only server preventing you from playing with your buddies who don’t have headsets. Regular and VR players can reportedly play together in the same instance. Of course, studios always put their best foot forward before release, so I’ll reserve judgment until Beyond has been out for a bit. However, if it works and looks as advertised, I may consider picking up a VR headset — something I have been putting off due to nothing striking my fancy. The Beyond update is free to current owners of the game. No Man’s Sky is available on PS4, XB1, and PC. VR support will extend to all platforms, so whether you have a PSVR or Oculus Rift, the update should have you covered. Hello Games is also releasing a physical edition with the Beyond update so look for possible game/VR bundles to boost the sales of both. The studio has yet to reveal what the third arm of its Beyond mega update will be, but as the patch is due for a release this summer, we should hear about it real soon. If we were to use the time between the first two announcements, the final reveal should come in less than two weeks.